We’re constantly sold the benefits of leading a healthy, active lifestyle. Regular exercise and eating well – we’re told – will help us look and feel our best. Yes, there’s the minor expense of a gym membership and the odd bulk order of egg whites and protein powder to contend with but, by and large, there are few downsides to staying in shape. Apart from one major sartorial concern, of course: finding clothes that fit you. If you’re of a muscular or bulky build, sourcing off-the-peg styles can be more arduous than dragging yourself to a circuit training session at 6am in the morning. Due to menswear’s current fit trends not being suited to larger than average builds, guys who are in better shape than most tend to use the lack of available options on the shop floor as an excuse not to dress as well as they could. Real talk, guys: you’re not doing yourself justice. What’s the point of spending so much time trying to look good naked when you don’t look that good clothed beforehand? Although finding garments that fit well may not be as straightforward as it is for your beanpole-y brothers, there’s plenty you can do to up your wardrobe game, while also upping your one-rep max. Before we begin, it’s important to remember that there’s no ‘one size fits all’ solution. The muscular men amongst us come in all shapes and sizes owing to the variety of movements and motions involved in different athletic activities. For example, footballers and cyclists tend to have muscular lower bodies but are often trim and lean up top. Gym rats are typically broad through the chest, shoulders and back but may be comparatively slender through the lower body due to skipping leg day (not cool, bruh). Rugby players, well, they’re just big all over. And possibly slim-fits, too – super-slim shirts and drainpipe jeans simply weren’t designed with your body type in mind. Rather than buying into these trend fits, focus on what really works for your individual shape and don’t be afraid to use different cuts on your upper and lower half. For example, bottom heavy? Tapered legwear is great for achieving the industry’s now standardised streamlined silhouette for those with larger thighs, while others may even find that classic- or straight-cut styles fit like a slim-cut anyway. Up top, you may be shredded rather than huge, which means you could consider sharply tailored shirts, rather than boxy tees and sweatshirts. It’s down to you to experiment with the various cuts on the market and find what works well for you, and you alone. Due to vanity sizing (especially prevalent with US brands), you’ll find that your body could fit everything from a medium to an extra large, depending on the label and its house cut. If you usually take an extra large in T-shirts but find that you’re swimming in that style you’ve just tried on, then man up and size down – there’s no shame in it. Especially if you’re on the taller end of the spectrum. Horizontal lines created using classic width belts (no skinny or supersized styles) or Breton stripes will help break up your height. Similarly, short and stocky guys will benefit from vertical lines like ties or pinstripes, which work to lengthen the torso. A good tailor will help you alter your clothing to fit your size – no matter how beastly your quads or wide your lats. So long as the item fits in the key areas, everything else can be trimmed, cut or expanded to fit you properly. This person will literally be the difference between your clothes looking like a shapeless sack and appearing as though they were made for you. And then stick with them. Certain brands, especially high-end labels, simply don’t cut for guys with builds that are more muscular than average. The vast majority of designer brands – with the odd exception, like Calvin Klein Collection – use ‘fashionably’ thin models when developing their product, meaning even the max size in the range just won’t sit right. Once you find a brand that caters well for your colossal quads or huge traps, note it and consider stocking up on the same style in different colour ways. You’re already an imposing figure. No need to be an imposing figure in canary yellow. We’re not saying you need to banish bright colours from your wardrobe entirely (especially not during warmer seasons) but it’s worth bearing in mind that something which is statement-making for an averagely built bloke is amplified tenfold on your frame. Now you’ve got the basics down pat, it’s time to take a closer look at specific problem areas, and what you can do to make sure you look in your prime, rather than subpar. When it comes to shirts – be it dress or casual – the most important thing is to make sure that it fits well around your neck and across your shoulders. You should be able to fit a finger between your neck and the collar of the shirt and there should be no tightness or puckering of material across your chest, shoulders or upper back. The shirt fits well through the chest and shoulders but billows due to excess fabric at the waist. This can be easily rectified with darting – a process that involves taking extra fabric from the back of the shirt, folding it over and sewing it together. The shirt fits well in most respects but the sleeves are too long. A good tailor can easily shorten your shirt sleeves to the appropriate length. Alternatively, check out brands like Hugh & Crye, which design especially for muscular guys. The label’s athletic-fit shirts feature darts and slightly lower armholes to flatter men with a bigger ‘drop’ – i.e. the reduction in number of inches between the size of a suit jacket and the waist size of the accompanying trousers. Other lines that have received good feedback on many forums include T.M. Lewin’s regular- and slim-fit shirts, Charles Tyrwhitt’s classic- and slim-fit shirts, and J.Crew’s Crosby shirts. High street stalwart Marks & Spencer also offer an online made-to-measure service that is well worth exploring, with the brand guaranteeing a perfect fit or else a replacement shirt will be made to your exact measurements. Find yourself sizing up to squeeze your thighs into trousers, only for the waistband to bunch like a rugby forward’s, mid-scrum? It’s time to explore new styles of chinos, trousers and jeans. As we’ve already touched upon, skinny and slim fits won’t sit well, so try classic straight, regular and tapered fits instead. These should not only feel more comfortable to wear, but also help to keep your legs looking in proportion. Once you’ve found a style that fits comfortably through the thigh and seat, take a look in the mirror and see whether or not you need alterations made in the waist or through the leg, from the knee down (a process known as ‘skimming’). When it comes to denim, look out for brands offering stretch styles. The likes of Levi’s and Nudie are now incorporating a little elastane into many of their jeans, making them a good deal more accommodating for legs that are above-average in circumference. In terms of recommended brands and cuts, there are a few that continue to earn rave reviews from athletic guys: Levi’s 501 Original and Tapered Jeans, Dockers’ Standard Tapered Fit Alpha Khakis, GAP’s New Classic Fit Khakis, and Banana Republic’s Emerson Vintage Straight Chinos. If you’re beefier than most, you may have a considerably greater drop. A normal drop is around six inches, so a guy that fits this mould would, for example, take a 40-inch suit jacket and a 34-inch suit trouser. However, it’s not unheard of for muscular guys to have a 10-inch drop – and this can make finding ready-to-wear suits that fit nigh on impossible. Track down brands offering off-the-peg tailoring that’s meant for your body type. The Crosby suit (see below), from all-American outfitters J.Crew, is specially designed for athletic guys, offering additional room in the arms, shoulders, chest and legs. It may sound obvious, but opt for brands that sell their matching suit blazers and trousers separately, rather than as a whole. This will allow you to purchase your correct size for both the jacket and trousers (allowing you to create your own ‘drop’). Go bespoke with a made-to-measure (M2M) company or trusted tailor. New York-based Black Lapel is an online M2M outfit with great customer reviews that offers free delivery and returns, and carefully crafts suits, blazers, trousers and plenty of other tailoring staples to your exact measurements. 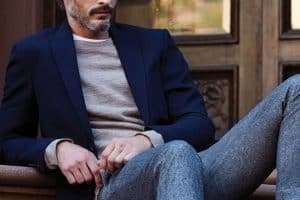 As mentioned above, J.Crew are one of the very few designer brands that have developed a suit specifically for athletic builds. Ahead of its release, Frank Muytjens, the brand’s Menswear Director, explained what went into crafting the new silhouette to GQ.com: “We focused on the upper torso, biceps and shoulders the most. We opened up the armhole, made the shoulder a little wider and worked on opening up the body as well. We also widened the lapel a hair, just to make sure everything was proportional. Yet it’s all very well adding extra inches – after all, that’s common sense – but how did the brand manage to maintain that desired, tailored appearance? “We fit it on as many athletic guys as we could so it would still look like a tailored suit, hugging in all the right places,” said Muytjens. Let’s not forget that there are plenty of pieces that work well for thicker guys without much thought. T-shirts, Henleys, polo shirts and knitwear with a little bit of stretch look great on muscular men and will feel comfortable no matter if you’re in the middle of a cut or still feeling the pump from your last session. Likewise, lightweight bomber jackets (not huge, padded MA-1s) and unstructured/unlined blazers will fit your frame and showcase your broad shoulders and chest, while casual shirts in relaxed fabrics such as flannel, chambray and washed cotton are solid, versatile options that you will be able to call on time and time again. Although it might require going the extra mile (that’s hardly new to you, though, right?) to guarantee good fit, it’s worth the time and effort, broadening the number of sartorial options available to you and ensuring you look your very best. Put the effort into trying on clothes in store and find out what brands work for you. Ignore trends and fads and stick to what looks best on your body type. And finally, don’t hide, or show off, your body with clothing that’s either too loose or too tight. You should be aiming to hint at your physical prowess, not parade it like a forgotten Geordie/Jersey Shore cast member. Are you an L to XL and interested in all things style? Have any tips or favourite brands to share? Make sure you drop us a comment below.